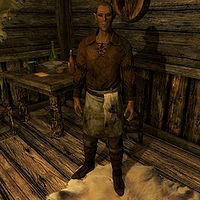 Ungrien is a Bosmer food vendor and an employee of the Black-Briar Meadery in Riften. He staffs the tasting counter at the front of the meadery, and gives glowing endorsements of the mead and Maven Black-Briar's business practices under penalty of dismissal (and possibly execution). He resides in Haelga's Bunkhouse, sleeping there from 1am to 6am. He begins his day with a one-hour breakfast, then heads to the Black-Briar Meadery and starts work. At noon, he takes some time off to eat a meal for an hour. His workday ends at 10pm, when he spends his leisure time at the Bunkhouse. Ungrien wears a set of barkeep clothes and a pair of shoes. He is equipped with a leveled dagger which can be up to elven quality, and carries a selection of common items and gold. If you see him at the meadery, he will offer you some Black-Briar Mead, saying, "Welcome! Allow me to recommend the Black-Briar Mead... the purest brew in all of Skyrim! ", "Hello there, can I pour you a Black-Briar Mead? ", "We serve only the best here... Black-Briar Mead. May I get one for you? ", or "Ah good, back for some more Black-Briar mead, eh?" Outside the meadery, he will instead say, "I'm off work at the Black-Briar Meadery. I'll be back there in the morning." Upon ending conversation, he will tell you, "Come back and see us again!" if he is at the meadery or "Travel safe." On what makes Black-Briar Mead so special, he has this to say: "Lady Maven's been developing the secret recipe for Black-Briar Mead over the last several decades. She uses a very secret blend of spices, fresh honey from Goldenglow Estate and specially constructed aging casks to ensure the best flavor. Even when you get to the last sip in your flagon, it'll taste just as good as the first!" You can mention that his answer sounded rehearsed. Ungrien will retort, "Damn it! Sorry. I'm not very good at this. Look, just don't say anything to Maven, will you? I've spent weeks trying to get that right and if she sees how stupid I am, she'll get rid of me." Comment on how there are worse things than being fired, and he will remark, "Yeah... fired. Sure. That's what I meant." If you ask him about Maven Black-Briar, he will attempt to show his appreciation for her, telling you, "She's an absolute pleasure to work for! In fact, I almost feel guilty accepting pay from her. Why, just this last week I was commenting to my fellow meadery workers just how lucky we are to be working for such a charitable family." When told you're glad he's so happy, he will concur: "Sure am! I thank my lucky stars every time I look to the night sky that Maven took me in and gave me this opportunity." It is possible to convince him to admit the truth, provided that you have enough money or at least level 25 in Speech. If you failed, his comment will depend on which method you attempted. "That is the truth, my friend! Maven is a saint and don't let anyone tell you otherwise." "It's going to take a lot more than that." Succeeding at the Speech check will yield you this from Ungrien: "Okay, look. If I'm caught saying anything bad about the meadery or the family, I'm a dead man. I'm the fourth person to work the tasting counter in the last year. The last three are at the bottom of Lake Honrich." He will end by suggesting, "Just take my advice and just get out of Riften as soon as you can." During the quest Spread the Love, he will accept your pamphlet: "I'll read it. Thank you." When he passes by Snilf begging for money, he will apologize for having nothing to offer: "If I had even a pot to piss in, I'd gladly share. Sorry." Similarly, he will reply, "I would if I could, but I can barely make ends meet." to Edda. Indaryn: "Ungrien! I just found another spoiled keg! What's the matter with you?" Ungrien: "I... I'm sorry. I could have sworn I sealed it." Indaryn: "Tell me something. Do you enjoy spending Lady Maven's gold for her? It certainly seems that way." Indaryn: "This is the last warning. You do it again, and you'll be sleeping in Beggar's Row with the rest of the riff-raff!" Ungrien: "I don't know if I can stand the abuse here much longer. They treat us like outcasts." Valindor: "The Dark Elves and the Wood Elves have never been the best of friends. Be patient, they'll come around soon enough!" Ungrien: "Wretched Dark Elves. It's just my luck I ended up working under one of them." Valindor: "Chin up, Ungrien! Remember, you have a roof over your head and food in your belly thanks to the very same Dark Elves. Be thankful." Ungrien: "I can't take it anymore, Tythis. Indaryn keeps pushing me around and I'm not even doing anything wrong." Tythis: "Maybe it's time you quit then." Ungrien: "And do what? Losing a job from the Black-Briar family would make me a marked man. No one would ever take me on anywhere else." Tythis: "Don't let it get you down. Indaryn will eventually tire of picking on you and move on to someone else." After completing the Thieves Guild quest line, he may disappear, and be replaced by Romlyn Dreth. It is unclear why this happens, as Ungrien's disappearance does not appear to be scripted. Ungrien has a Speech leveling glitch. You can repeatedly persuade Ungrien to tell the truth about Maven Black-Briar, and increase Speech. This works all the way up to 100. This page was last modified on 19 August 2015, at 14:00.